CryptoLocker is a screen locker infection else known as ransomware program. It is distributed by Trojan:Win32/Crilock.A Trojan and unlike other ransomware applications known to us, this one does not try to convince you that you have committed serious crime in order to push you into paying the ransom fee. CryptoLocker just states that your computer is locked, your files are encrypted, and to restore your desktop access you need to pay 100 USD or 100 EUR via MoneyPak, Ukash or any other applicable alternative payment system. However, instead of paying the ransom, you should unlock your PC and remove CryptoLocker right now. Since this infection is distributed by Trojans, it is very likely that your computer has been infected prior to the lock-out. Trojans enter target systems surreptitiously and they do not manifest their presence until it is too late. Therefore, in order to avoid such dangerous infections as CryptoLocker, it is important that you run regular system scans with a reliable antimalware program, and intercept threats in the first stages of infection. Otherwise you may have to deal with annoying consequences such as, in CryptoLocker’s case, locked screen and encrypted files. Unfortunately, CryptoLocker’s claim that it has encrypted your files is real. According to the research carried out by security specialists, this ransomware application can encrypt almost any file you have on your hard drive, including files with such extensions as *.jpg, *.dng, *.3fr, *.arw, *.srf, *.sr2, *.bay, *.crw, *.cr2, *.dcr, *.kdc, *.erf, *.mef, *.mrw, *.nef, *.nrw, *.orf, *.raf, *.raw, *.rwl, *.rw2 and so on. With your files encrypted you will probably need to restore them from backup. It just shows how important it is to have a backup copy of your files in external hard drive, or a sky drive. However, even if you do transfer the required sum of money via alternative payment system, your computer will not be unlocked. 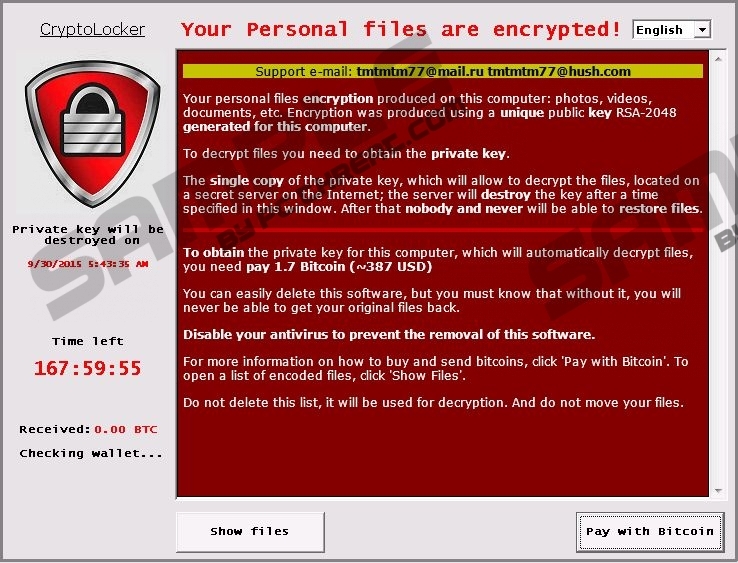 CryptoLocker tries to put you on edge, by giving you just 72 hours to pay up. Nevertheless, you should not succumb to these threats, because nothing good will come of spending your money on CryptoLocker. Refer to the instructions below instead to unlock your computer and then acquire a reliable computer security application that will help you remove CryptoLocker automatically. Do not hesitate to protect your PC when it is necessary to do so. Press Windows key and click metro Start menu will open. Click Internet Explorer tile and go to http://www.pcthreat.com/download-sph. Restart your computer and press F8 to load Advanced Boot Options menu. Install the program and scan your computer. Select Startup tab on System Configuration Utilities. Quick & tested solution for CryptoLocker removal. It's sad how desperate some people are to get money, but, the person who made CryptoLocker takes the cake.